State Capitals Quiz - Test Your Memory! The U.S. State Capitals Quiz above is an excellent way to test your memory. First study the list of states capitals, then try the quiz. To begin the quiz, enter your name and click the "Start" button. I made this state capitals quiz myself. I hope you find it challenging and useful. If you have trouble remembering capitals, check out the State Capitals Memorization Tip section below. The quiz is multiple-choice format. Each question displays the name of a state. Select the correct name of the capital of that state from the available multiple choice answers. In some cases, the name of the state capital is not one of the available choices. For those questions, choose "None of the above". A correct/incorrect indicator displays after you submit each answer. If you miss one, click the View Answer button to see the name of that state's capital. Fifty state capitals are a lot to memorize. Unless you have a naturally strong memory, you may want to use a memory technique to help remember them. With visualization and association, you create memorable mental images that remind you of the facts you want to recall. For example, suppose you want to very clearly remember, with no possibility of error, that Atlanta is the capital of Georgia. HOW TO DO IT. The first step is to think of an image that represents the state name "Georgia". The image should remind you of the sound of the name of the state. The picture also needs to be silly or outrageous, because your brain remembers the unusual. Ordinary images are too forgettable. The state name Georgia reminds me of the personal name "George". This calls to mind the historic figure George Washington, whose face appears on the dollar bill. The word Atlanta sounds like "ant" + "land on". It's okay to break down the word into a phrase of two or more words like that. And the phrase does not need to match the original word exactly; it just needs to come close (your brain does the rest). 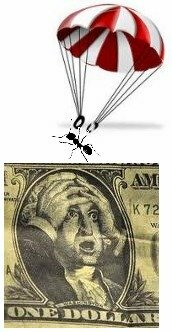 To remember that Atlanta is the capital of Georgia, picture an army of ants parachuting down onto the bald head of George Washington ("ant land on" + "George"). See this image in your mind in great detail, maybe even imagining that a surprised George is yelling and trying to slap the ants away before they bite him! Let's walk through how this crazy image helps you remember the name of the state capital of Georgia. It's simple, really. Assume you are taking the State Capitals Quiz above, and you reach the question asking for the capital of Georgia. If you have reviewed your state capitals memory images sufficiently, seeing the word "Georgia" instantly calls to mind George Washington's face. The strange image of ants dropping down and "landing on" George's head then pops into your mind automatically. "Ant land-on" + "George" = Atlanta, Georgia. Now you don't need to wonder whether Atlanta really is the capital of Georgia, or whether the capital might be Savannah or Macon or something else. The fun, crazy mental image we created using the "visualization and association" memory technique guarantees you get it right. Atlanta is the only city that fits the image. The reason visualization and association works so well is that images are usually much easier to remember than abstract facts. Give this memory technique a try! I think you'll be surprised at how well it works.